Helping you explore new possibilities for the most important people in your life. Have you ever known someone personally who was in a memory care facility? Did they seem to disappear into themselves as you watched? Maybe they lost the ability to recognize you or other people they loved. It can be so painful when that happens. Eventually, they may have hung their head… stopped speaking. And you probably felt you had lost them forever. You probably tried to talk to them…but there was no response. These are such heartbreaking milestones for you. Dementia is a cruel beast, but research is finding more and more ways to bypass this beast’s chains, and forge a new path for your loved one to experience happier more fulfilling moments in her last years. Medication provides one line of defense, and research is ongoing to find others ways to help your loved one continue to experience moments of clarity and connection in life while the disease progresses. So let’s talk about you. We know you’ve already grieved over your loved one’s decline. We know you’ve grieved over the diagnosis. This is not your first step in the journey…but a step some distance down the road. Our hearts go out to you, and we want to help. We respect your journey and we’re here to support you. We offer our assistance to answer your questions, help you talk through options, and present – or direct you to – all the information we can. These decisions are not easy. We know so well how tough this time of life is…and we’re here to help. To listen. To try to understand. And to care. So please don’t be shy. We have your back. 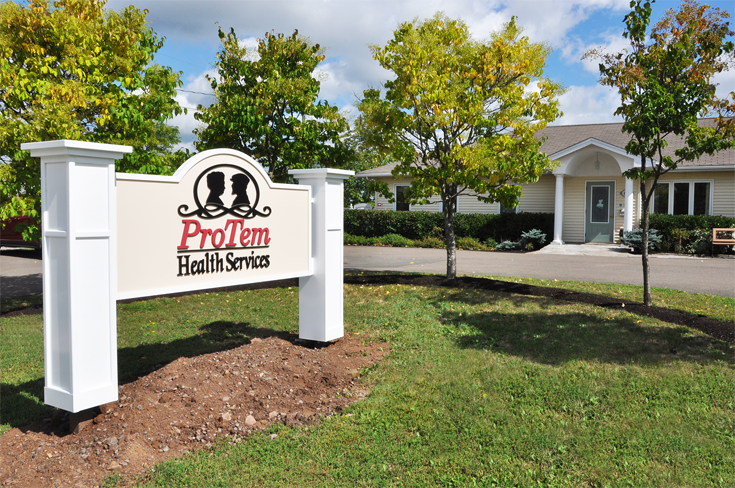 Call 1.506.874.9652, or email us at info@protem.ca. Whatever is easiest for you. And… if you choose to trust us with your loved one, we’ll take that trust deeply to heart. You’ll love the contentment and activity you’ll see when you visit. And we’ll always enjoy seeing you, too. Now, do come inside and browse around. You’ll learn about the therapies we work into all of our interactions with our residents. Things like music, art, singing, cooking, and hugs. Our caregivers are amazing…you’ll see what we mean. You’ll see floor plans and learn about nursing care, our in-house physician and pharmacist, the home cooked meals and the beautiful gardens and fresh air. Then, go ahead and give us a call us and let’s talk. At ProTem, we’ve researched the best methods to incorporate into our therapeutic moment-to-moment interactions with your loved one. We have five homes, each a self-sufficient “family” of its own. Each home includes ten bedrooms, a living room and a kitchen at the center of the home, plus safe and easily-accessed bathrooms. The family atmosphere that develops in each home follows a natural course, inclusive of caregivers. Our very special caregivers work consistently within a single home so your loved one is not exposed to upsetting changes once they settle in. Our residents develop relationships with each other and with their caregivers just as members of any household make a house a home. They can rely on seeing the same caregivers every day, and they become very familiar and close to them. When you visit, you might be surprised to see that we have only limited behavior problems with our residents, and when they arise they’re well-managed. You probably are aware how rare this is in dementia care. One reason is that our residents aren’t lonely. Our residents are happy, peaceful, engaged in life, and feel cared about. Their days are of full of interaction and beauty. Our caregivers are trained and certified for working with residents with dementia, and every moment of every day is designed to bring life, stimulation, pleasure, and more clarity for each resident. With the use of stimulating and enjoyable activities, and research-based methods, our staff of nurses and caregivers help to bring affection, connection, peace, and joy into everything your loved one does. This is not a facility, but rather home to lovely residents who have lived full lives with all their innate talents and accomplishments and are making the very most of their final stage of life. This is why we call our memory care residence ProTem. One of the important questions you probably have is whether you can afford to move your loved one to ProTem. And while this isn’t the most important question, it plays a big role in your mom’s, dad’s, or sibling’s future. As you know, affordability is complicated. We won’t be your cheapest option, nor do we strive to be. In order to provide the very best dementia care we need to staff at a higher ratio. Higher care means higher staffing costs. Your loved one deserves more than the bare minimum. They deserve the very best. And providing the very best quality care costs money. We have someone who sharpens the pencil every day to work with our families to determine if ProTem is the right fit. The first question you’ll be asked is whether your loved one has been assessed as 3B. But…I’m getting ahead of myself. Your first step is to call us at 506-874-9652. Or if you’d like us to mail you an information package complete with pricing information, meal plans, activity calendars, and more, fill in your details below. Set your mind at ease. We’ve got your back. Call 506.874.9652 or email us and we’ll walk through every step with you. If you aren’t quite ready to call yet, click here to have a full package mailed to you, including a pricing information. Set your mind at easy. We’ve got your back.